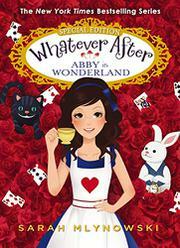 When Frankie falls down a rabbit hole, Abby; her nemesis, Penny; and her good friend Robin all follow. Although they don’t find Frankie immediately, they soon recognize their surroundings. There’s something familiar about them: “The hole we fell down. The hallway with locked doors. The garden outside. The potion that says DRINK ME.” Usually in the Whatever After series, Abby enters the familiar world of fairy tales with her little brother, Jonah. She knows what should happen even though the two always change the courses of the stories. Now she finds herself in a book world, and she doesn’t want to admit to the other girls, especially Penny, that she has never read it. To make matters worse, Alice’s Adventures in Wonderland is one of the few books Penny says she’s read. Soon the girls discover that she never read the whole book, and she balks at every opportunity to participate in the fun. Frankie is pictured as a person of color on the back of the book and described as having dark skin. The others girls are white, with different hair colors (and personalities) to distinguish them. When they catch up with Frankie at the tea party, she is totally into the adventure. She is the real bookworm of the group, and she’s read Alice and its sequel many times.